The Electric Wasp. 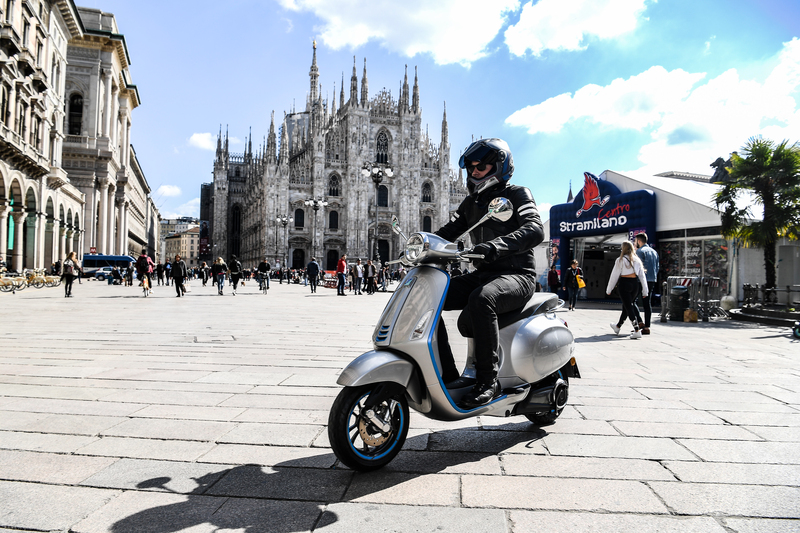 We were turned loose, a silent swarm of nocuous moto-journos descending upon the city, sneaking up on the unsuspecting fashion-forward folk of Milan, only to be seen as a flash of silver and blue as we sped by. An exaggeration? 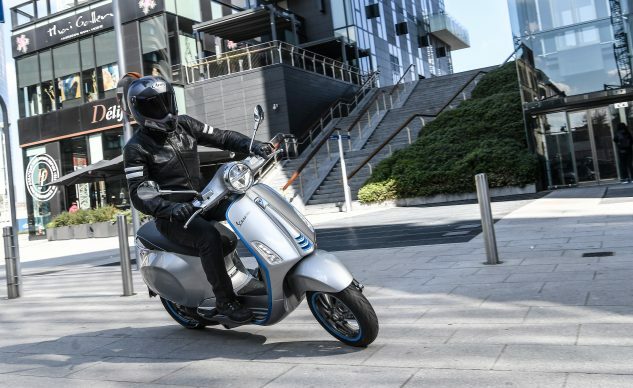 Possibly, but nevertheless, we were there to test Vespa’s 2019 Elettrica, and we wouldn’t stop until we had fully exhausted the scooter’s battery and our fellow commuter’s patience. Wait. What’s that? We’ll only be riding for an hour and a half? Well, alright let me backtrack on my previous statement. We wouldn’t stop until they made us, and it was time for lunch! Although we had only 90 minutes on the 2019 Vespa Elettrica, we managed to learn some interesting information about the scoot’s positioning in the market as well as developing our initial riding impressions. 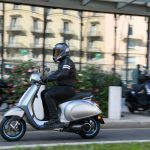 The 2019 Vespa Elettrica is positioned, and has been developed, to be the electric equivalent to a 50cc scooter. Vespa believes this entry-level arena makes sense for the company to focus its efforts of building a new platform with hopes of ushering in a new generation of riders who are interested in emerging technologies and connectivity. This was, as Vespa cites, how the company came about in the first place, as a low cost, approachable, small-frame solution to mobility. 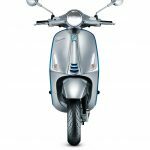 For the urban environment, the Vespa Elettrica is an enticing option for commuters, while also being an elegant luxury item for others. In the US, many states do not require specific licensing for cycles 50cc or less. 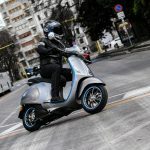 The Elettrica has been homologated as such for this reason – and not only in the States, but also for licensing tiers overseas where scooters are much more common for urban mobility. Breaking down barriers like these can make all the difference to potential buyers and new riders. For storage, the Elettrica has a small compartment complete with a USB outlet in the leg shield in addition to the under seat storage which can fit a small-ish helmet (it would not accept the medium Arai XD-4 I was wearing during the test, though it did hold another editor’s HJC full-face). There are, however, a couple of sticking points when considering the Elettrica which may be a challenge for the brand in the US. First of which is top speed. 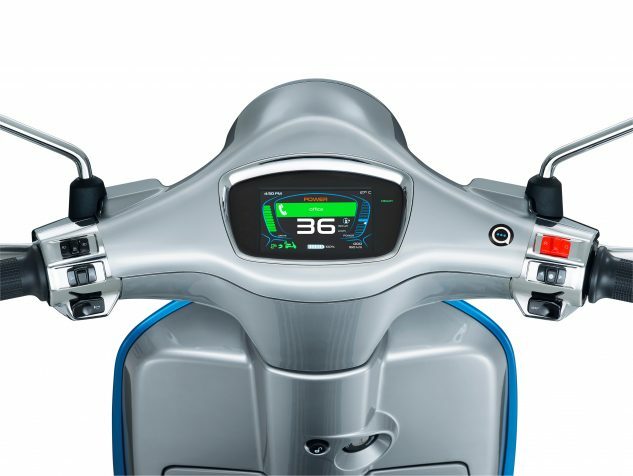 There are two power modes: ECO and Power which have top speeds of 18.6 mph and 30 mph respectively. This means the Elettrica won’t be able to meet the 35 mph speed limits common around big and small American towns. Secondly, the MSRP. The price tag is steep at $7,499. 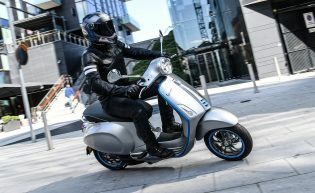 As is typical with Vespa products, the Elettrica exudes quality from fit and finish to the technology packed into its silver-painted steel chassis, this is clear, but when looking at the 50cc scooter market, the Elettrica is still nearly $3,500 more than the next most expensive 50cc option, the 50cc Vespa Sprint. 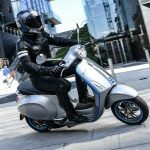 We’re told Vespa doesn’t intend to sell massive quantities of the Elettrica here in the states and that they are realistic about the e-scooter’s place in the market. That being said, the entire first shipment to the US, 20 or so units, is already spoken for by way of online pre-orders. 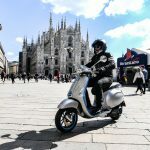 We spent an hour and a half riding the Elettrica around the streets of Milan taking pictures and dodging traffic. The 30 mph top speed never proved to be an issue. Of course, most cities in the US are not as densely packed and congested to the point that many large European cities are, nevertheless, top speed was never an issue during our ride. 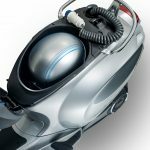 Vespa claims approximately 5.4 horsepower and 147.5 lb-ft of torque. I’ll give you a moment to clean your spat coffee off of the screen. 147.5 lb-ft of torque?! Wouldn’t one twist of the wrist send the 53.1-inch wheelbased scoot into a perpetual cartwheel?! Alas, worry not e-curious reader! 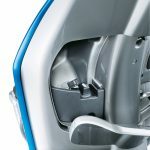 The Elettrica’s torque curve is electronically tailored to provide a slow smooth smattering as the throttle is applied. In fact, whacking the throttle open delivers less than ideal acceleration from a standstill. Speed builds quickly, but not immediately. I would have been happy to have a touch more get up and go to beat those Citroëns and Peugeots off the line. 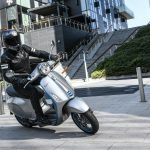 Should you not find yourself lined up against two cars and a dozen throttle-happy scooter commuters in a drag race to the urban holeshot, you’ll likely have no issue with the power delivery. A few Elettrica motors attached to swingarms awaiting assembly at the Piaggio manufacturing facility in Pontedera, Italy. The Elettrica uses a proprietary Piaggio brushless motor with KERS (Kinetic Energy Recovery System). Power is rated at 3.5 kW with a peak of 4 kW – approximately 5.4 hp. 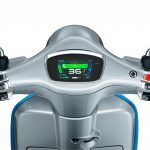 Vespa rates the lithium battery capacity at 86 Ah which, if my less than stellar history in mathematics proves me correct, translates to 4.128 kWh, the more standard measurement among two-wheeled electrics. For reference, the new Zero SR/F’s battery capacity is rated at 14.4 kWh. There are two levels of regenerative braking which can be adjusted via the Elettrica’s 4.3-inch TFT display. I was barely able to tell the difference between the two, but also never had a clean run in traffic to test it carefully. The heavier regen we’re told provides more regenerative energy back into the battery via the KERS. A full charge is said to take 4 hours with a 220V outlet (8 hours with a standard 110v) and range is claimed at 50 miles in Power mode or 62 when in Eco. The Elettrica’s display is intuitive and easy to navigate via the scooter’s right side switchgears. Testing ECO mode while darting through traffic in Milan was an unwise decision. It would turn out that 18.6 mph is not enough to keep up with traffic, prompting us all to use Power as the preferred mode. A third mode is also included: Reverse! A helpful feature for navigating parking situations along packed curbsides. Information is delivered via the TFT display such as battery life, trip data, real-time energy consumption, and regen. Should you connect your smartphone via the Vespa app, you can also view incoming calls, messages, and music. 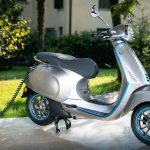 Other features accessible through the app include battery charge use percentage, statistics on the last 30 trips, push notifications on the battery charge status, and number of recharge cycles carried out – of which Vespa claims up to 1,000 of before any kind of battery degradation begins. Don’t love the blue trim? Not a problem. There are six other trim colors available as accessories. Getting the Elettrica stopped after wicking it up to its 30 mph top speed is anything but confidence inspiring. 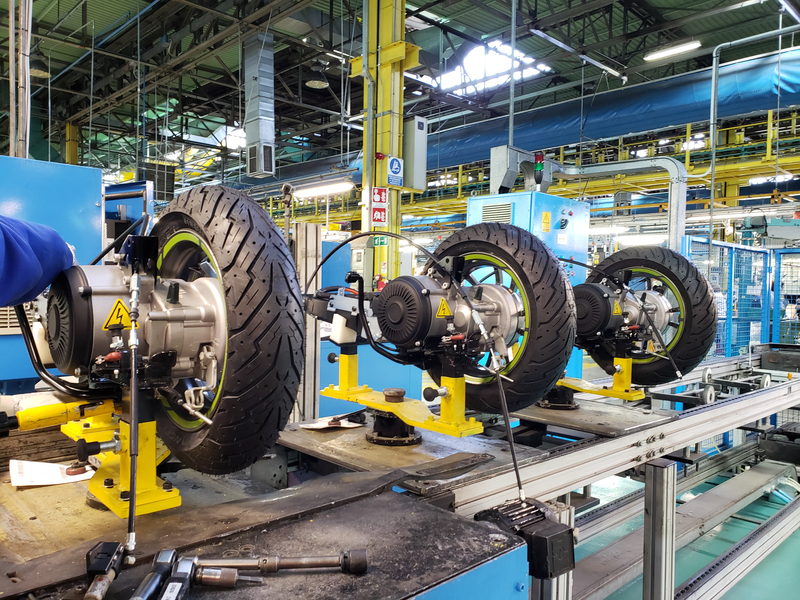 Both the front, a hydraulic 200mm disc and caliper system, as well as the rear, a mechanically operated drum system, require a firm squeeze at the lever to get things slowed down. 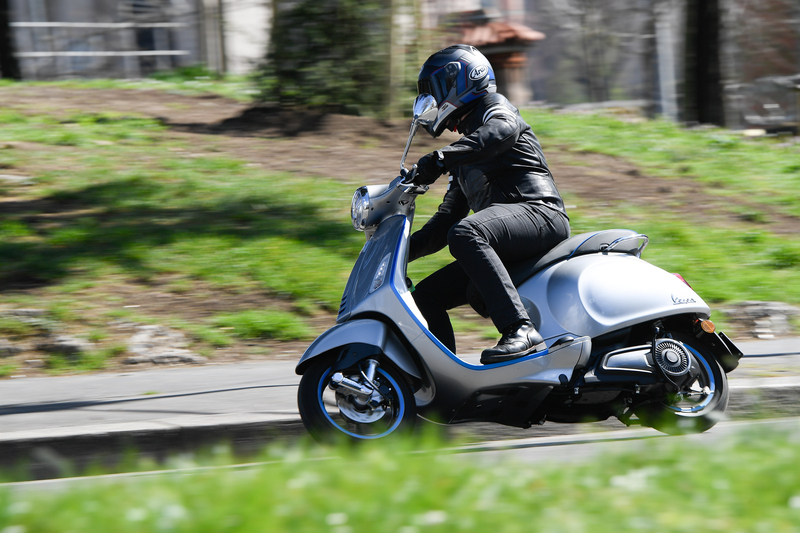 While the rear brake provides decent stopping power due to so much of the scooter and rider’s weight being located aft, squeezing the lever a touch too hard will result in skidding. Only the front wheel is equipped with ABS. Best to get used to extra space required when braking before you find yourself in dire straits. 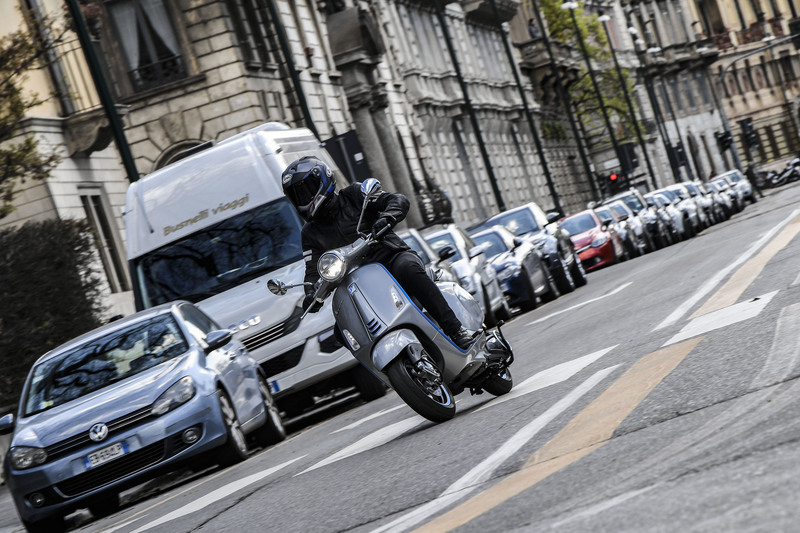 Other than the weak brakes and lack of initial throttle response, the Vespa Elettrica is comfortable and nimble, paramount when making quick decisions while navigating traffic. Just stay on the throttle and off of the coward levers and you’ll be A-okay. 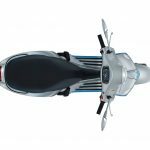 The single-arm fork with coil spring and hydraulic monoshock front suspension coupled with the rear monoshock provides a stiff, yet compliant ride for the 225-pound scoot. 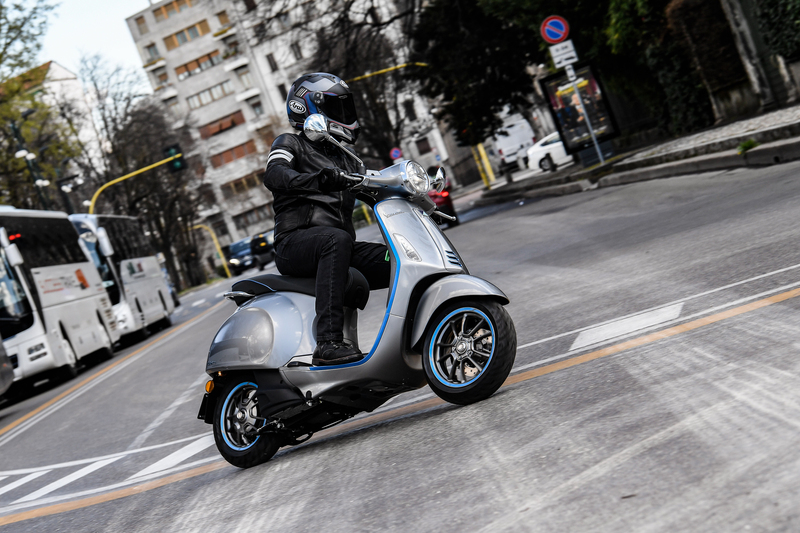 Overall, riding the Elettrica around Milan was a fun experience. 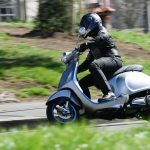 The scooter is incredibly agile and well-balanced while being slim enough to zip through congested traffic, doing so stealthily only adds to the fun. 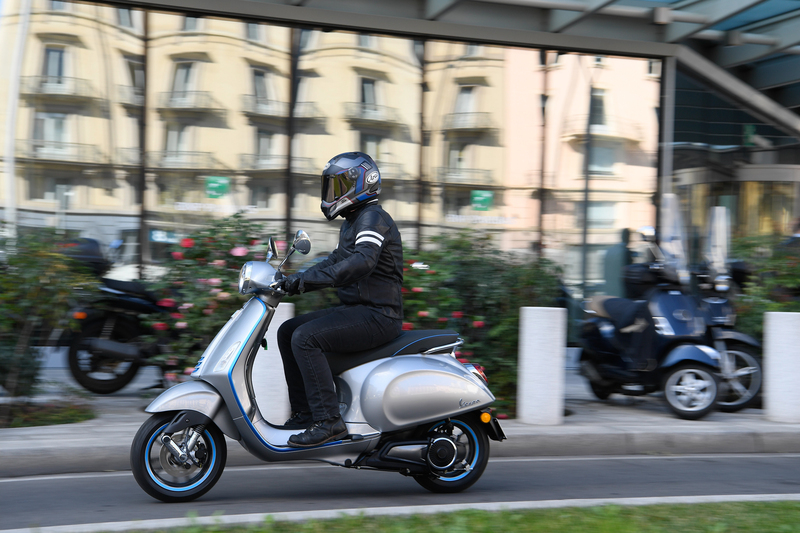 The new e-Vespa may have its own set of challenges in the North American market, but there’s no denying the quality and fun factor of which the Elettrica delivers in spades.